The Battle of Toba-Fushimi was part of the Boshin War, fought between those still loyal to the by now defunct Tokugawa Bakufu, and the newly instated pro-Imperial forces, and is named after the area where the allied Choshu, Satsuma and Tosa samurai fought against the Shogunate’s samurai near Fushimi, in the south of Kyoto. 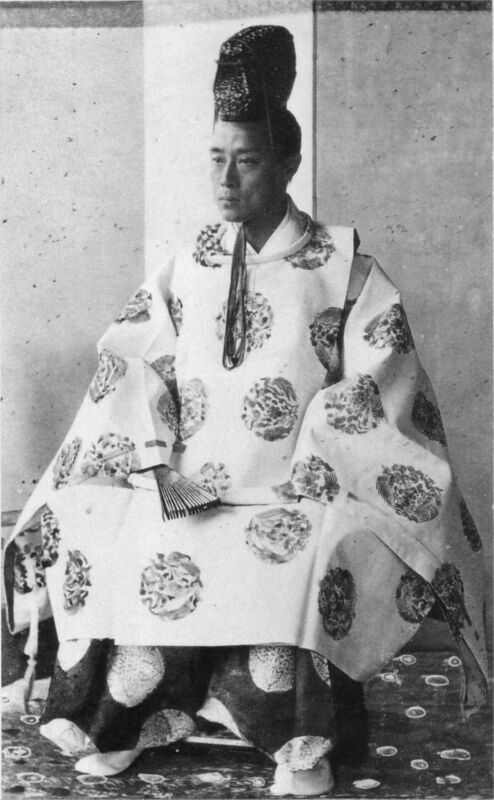 The 15th and final Shogun, Tokugawa Yoshinobu had officially resigned his position on January 4, ceding authority to the young Emperor Meiji. Aged only 15, Emperor Meiji had quickly organized an assembly of consultants to assist in adopting control and in throwing off the feudal system, bring Japan into the modern world. There were members among the Emperor’s staff who openly suggested a collaboration of sorts with the former Shogun, using his authority and name value to maintain a smooth, peaceful transition period. Others, such as Saigo Takamori were vehemently against such a move, arguing, even physically threatening the council members with violence, demanding Yoshinobu be mercilessly stripped of all his lands and titles. On January 17, the former Shogun Yoshinobu, while in Osaka Castle and suffering a severe cold, attempted to claw his way back into power by invalidating his own resignation. A week later, with Satsuma and Choshu samurai forces gathering in the Capital, Yoshinobu launched an attack on Kyoto, to “free” the Emperor from their control. A letter was sent to the Emperor from the ex-Shogun warning him of the “conspiracies” being hatched. Although the pro-Imperial forces were outnumbered by the Shogun’s men 3-1, they were better equipped, having British made howitzers, French Minie rifles, and a single American made rapid-fire Gatling gun. Both sides featured rag-tag armies of modern trained soldiers with modern firearm weapons, and traditional samurai armed with swords, spears and naginata. 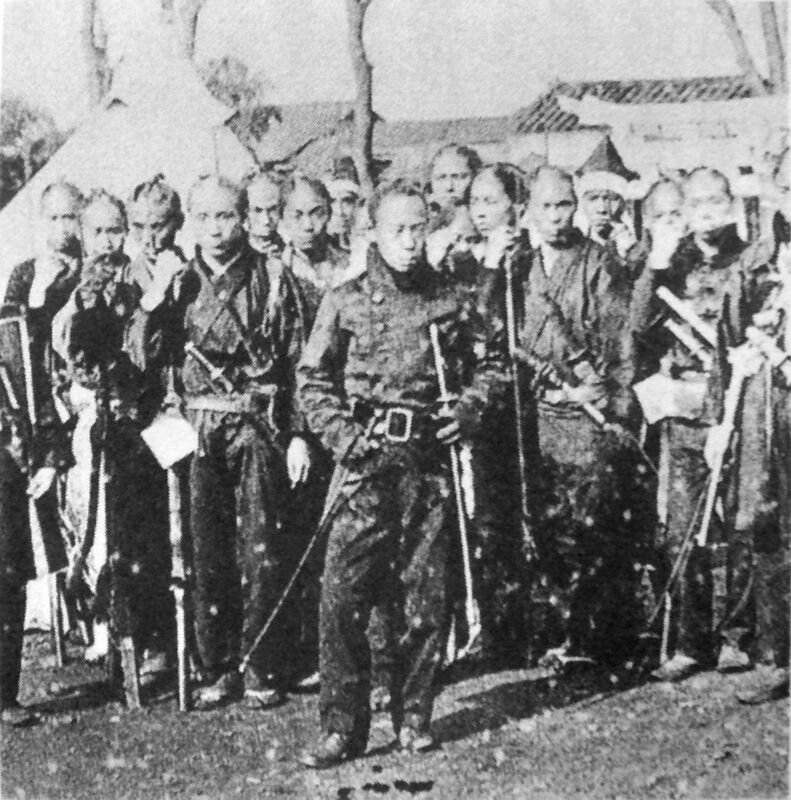 The four-day Battle of Toba-Fushimi commenced on January 27, 1868 when 15,000 pro-Shogunate troops consisting of samurai mostly from Kuwana (Mie Pref.) and Aizu (Fukushima Pref.) Domains along with Takamatsu (Kanagawa Pref.) Tsu (Mie Pref.) Matsuyama (Ehime) and Ogaki (Gifu) Domains, and supported by mercenaries and members of the Shinsengumi, the shogunate’s special police force, faced an opposition of 5,000 men. The opposing troops were made up of anti-Tokugawa samurai from the Satsuma (Kagoshima) Choshu (Yamaguchi) and Tosa (Kochi Pref.) domains. 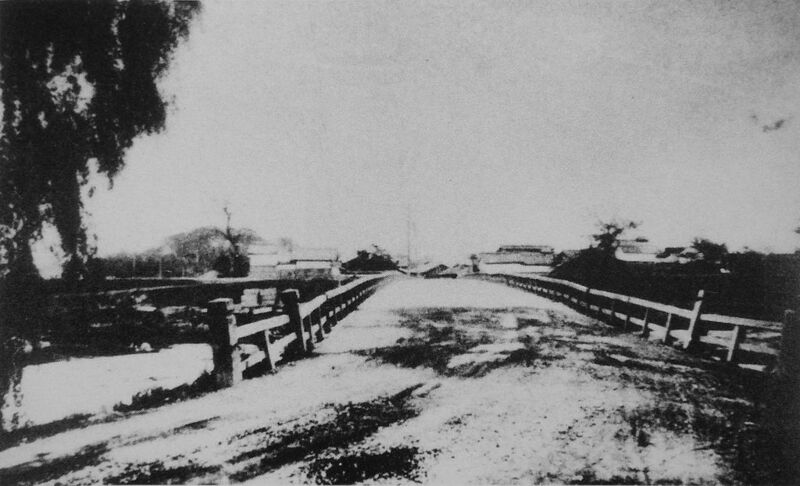 On the first day of the battle, January 27, 2,500 Shogunate troops approached Koeda Bridge in south Kyoto, where around 900 Satsuma troops had set up a barrier. Denying the Shogunate army passage across the bridge, the Satsuma clan opened fire. The shogun’s troops, the van consisting of samurai with traditional weapons, and backed by modern equipped riflemen, but their breaches empty having not expected any resistance, were slaughtered. The Kuwana troops held their ground, but were soon forced to retreat. The shogun had been dealt a stinging blow. The site of the battle is now a park with a monument to the fighting. Incidentally, when the first gunshots rang out at Koeda Bridge, a little further southeast at Bungobashi Bridge, Satsuma and Choshu forces there also opened fire on the Aizu and Shinsengumi army. Over the four-day battle, of the 15,000 pro-Tokugawa troops, 160 of the Shogun’s men were killed in action, with over 400 wounded. 100 Aizu samurai were killed, and over 150 wounded. 25 Kuwana samurai lost their lives and 60 returned injured. Of the 5,000 opposition, 61 Satsuma, and 35 Choshu samurai died, with around 230 wounded.